This wonderful Frozen Drink Machine rental is perfect for making a variety of frozen slush drinks or margarita drinks. If you are looking for a Margarita Machine Rental or a Frozen Drink Machine then you have found the right place. This Frozen Drink Machine comes with your choice of flavor. Choose from Margarita, Fruit Punch, Strawberry Daiquiri, Pina Colada, and Cherry. Mix 3 parts water with 1 part flavor mix, allow about 1 hour to prepare. 1 gallon flavor mix along with 3 gallons of water is good to make about 50 cups of wonderful Frozen Drinks. Price shown is generally for an 8 hour rental period, please select delivery and pickup times accordingly. 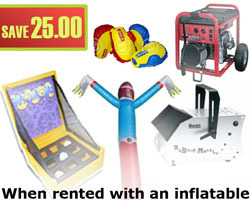 There is a $25.00 Delivery Fee for concession machines unless rented with an inflatable. The Delivery Fee, which is different from our delivery fees stated on the Delivery Chart, will be charged after checkout once our representative confirms the order with you over the phone. Select a delivery time at least 1 hour before your event start time. Next morning pickup, Overnight Option, is provided with a $25.00 fee. Next morning pickups are generally done between 8am and 12pm. It is the customers responsibility to measure the setup location to make sure rented product will fit. Cancellations must be done within 72 hours before the rental date or else a cancellation fee up to the entire rental amount may apply. Exceptions are made for cancellations on Rainy or Inclement weather days, please check Rain Policy for more information. Do you deliver and set up? Yes we do. 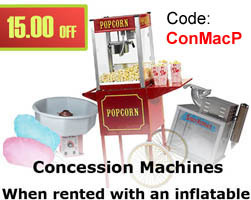 There is a $25 delivery fee for concession machines unless rented with a inflatable product. Please check our Delivery Chart for more information. Is a generator included with concession machine rentals? No. Generators are rented separately. If you will not have electrical power at the setup location (e.g. at parks) you will need to rent a generator. The Dolphin Jr. Wave is an inflatable water slide with a pool and misting system. 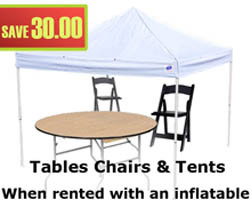 Great for summer parties or events. Need a regular water hose to connect misting system to. Good for ages 5 and up, maximum 200 pounds/person. These beautiful 10' Tube Dancers are eye-catching and bring in a crowd for your party or event. Price includes only 1 tube dancer.